Last term the Old Library hosted a visit by a group of retired members of the Royal Navy which included several alumni of Trinity Hall. Nearly all had served in the Navy and been posted to Russia, either in National Service or as Defence Attaches, diplomats or interpreters, and several had taught Russian in universities. It was a wonderful opportunity to take a different look at the material in our special collections and I was suprised at the riches I discovered! Historically Trinity Hall had a strong link with the Navy as a result of its teaching of the civil law. This equipped Trinity Hall lawyers for a career in either the Ecclesiastical Courts or the Admiralty Courts because both courts used civil law and not common law. This explains the existence in the Old Library of a number of books relating to naval matters. We have a charming late 17th-century (ca. 1660-1690) manuscript “Sea terms and geographical tracts” (MS.32) which deals with definitions of seafaring terms and contains a digest of geographical information necessary for understanding naval affairs. In addition, the Old Library has a two-volume manuscript, dating from ca.. 1693-1710, a “Miscellany on Admiralty and Maritime Law” (MS.43.1-2). 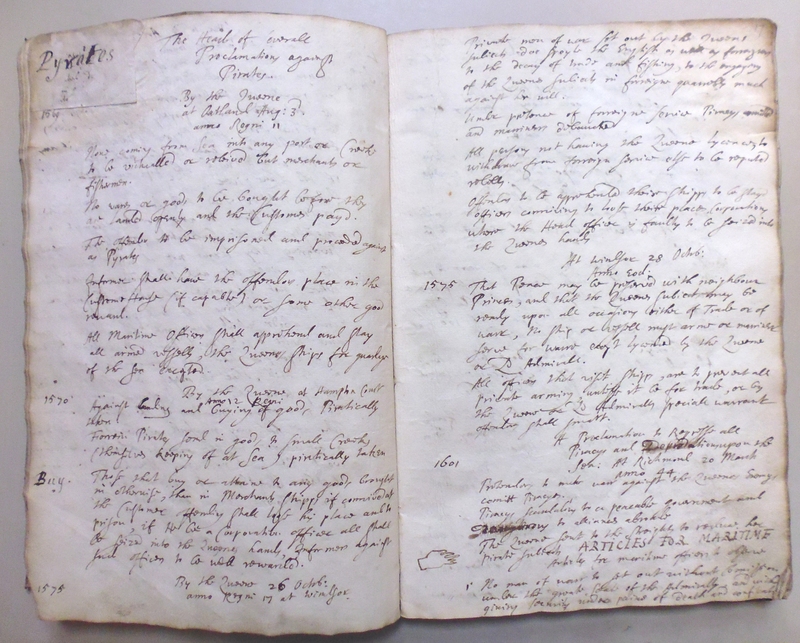 Written in several hands, this manuscript contains notes on civil law relating to Admiralty law which would be of direct relevance to any Trinity Hall law student intending to make his career in the Admiralty Courts. It belonged to a law student of All Souls, Oxford, whose signature at the front is dated 1693. 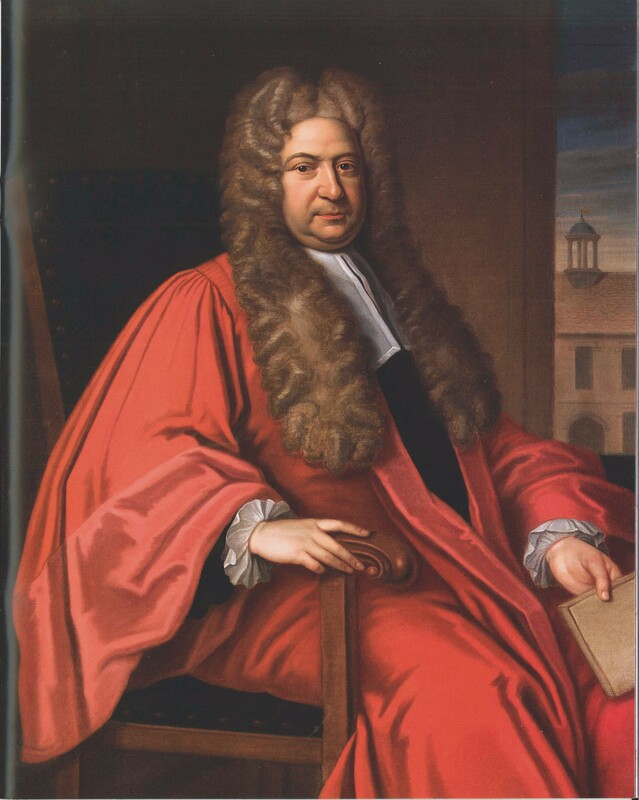 This student is none other than the notable lawyer and later Master of Trinity Hall, Sir Nathanael Lloyd! Continuing the seafaring theme, the Old Library also contains the “Life of Admiral Lord Nelson” (London, 1810) and two first editions of the voyages of Captain Cooke, “Voyage towards the South Pole” (London, 1777) and “Voyage to the Pacific Ocean” (London, 1784). All “must haves” for the gentleman’s country house library and for the fellows of Trinity Hall. But what of Russia? Well, the Old Library has a small collection of books on voyages and travels. 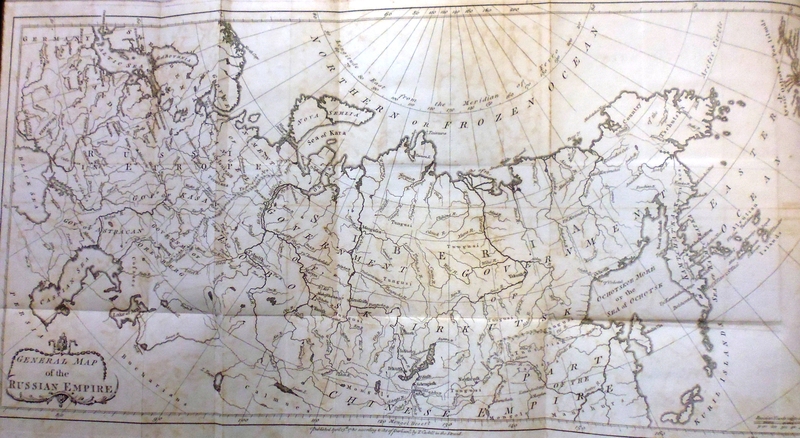 These include an “Account of the Russian discoveries between Asia and America” by William Coxe (London, 1780) containing wonderfully detailed maps of voyages; “Travels into Poland, Russia, Sweden, and Denmark” also by William Coxe (London, 1784) which has full-page engravings of Russian landmarks including St Basil’s and the Kremlin; and E. D. Clarke’s “Travels in various countries of Europe, Asia and Africa” (Cambridge, 1810-1823), the first part of which is on Russia Tartary and Turkey. Moreover, some recent additions to our special collections from the library of the late Lawrence Strangman include several books on Russia. 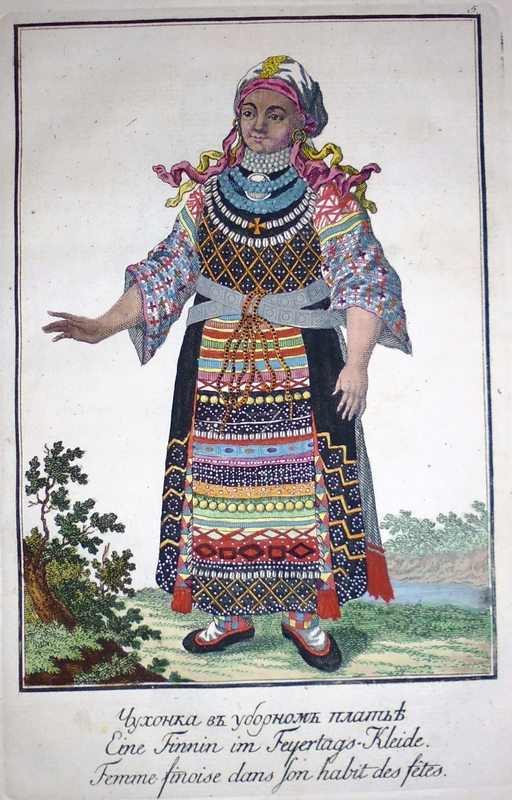 Most of these have delightful hand coloured plates. Johann Gottleib Georgi’s early work “Description de toutes les nations de l’empire de Russie” (St. Petersburg, 1776) contains brightly coloured plates which influenced many subsequent publications including the illustrations in the Russian volumes of “The world in miniature”, Ackerman’s pocket series edited by Frederick Shoberl (London, 1822-23). 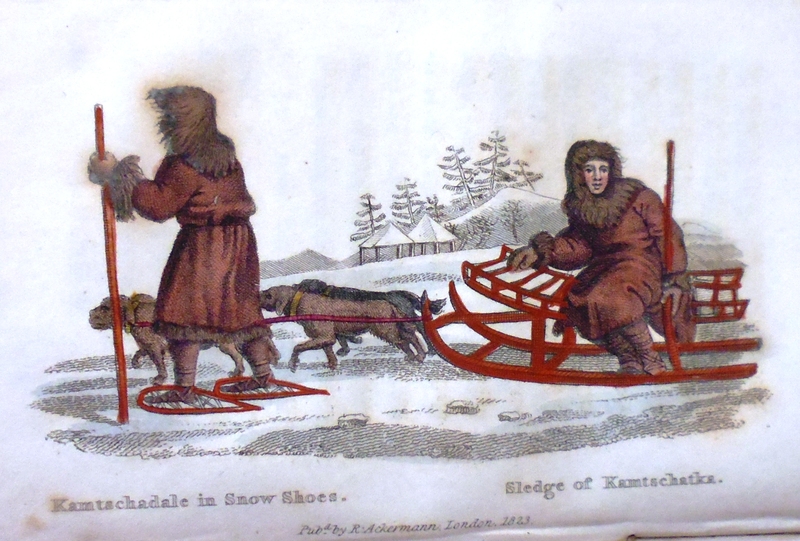 “Travels through the southern provinces of the Russian empire in the years 1793 and 1794” by P. S. Pallas (London, 1812) contains sophisticated hand-coloured plates of the topography and peoples of the Crimea. Also in Strangman’s collection is a volume of essays “Fugitive pieces, on various subjects” (London, 1765) which includes a chapter by Lord Whitworth, ‘An account of Russia, in the year 1710’. Of particular interest to our visitors was the detailed description of the vessels in the shipyards on the Don! Bringing the Russian connection into the 20th century, Trinity Hall is famous for two notorious alumni who spied for the Soviet Union: Alan Nunn May (TH 1930) and Donald Maclean (TH 1931). Although these men were contemporaries at Trinity Hall they were not close friends. Both were high achieving undergraduates (Nunn May gained a First in mathematics and physics, and Maclean a First in modern languages) and both were members of Cambridge University Communist Party. However, the similarity ends there. The outgoing Maclean was a member of the Trinity based communist study group with Blunt, Burgess, Cairncross and Philby (the Cambridge Five). He joined the Foreign Office in 1935 from where he passed secrets to the Soviet Union. Maclean defected to the Soviet Union in 1951 and died far away from the country of his birth in Moscow in 1963. Nunn May, an altogether quieter man, stayed on at Trinity Hall for a PhD in physics and then went to King’s College London in 1936. In 1943-44 he passed on vital atomic bomb secrets to the Soviet Union, saying at his trial at the High Court in 1946 “I thought this was a contribution I could make to the safety of mankind”. Nunn May was sentenced to 10 years, but was released early (in 1952). 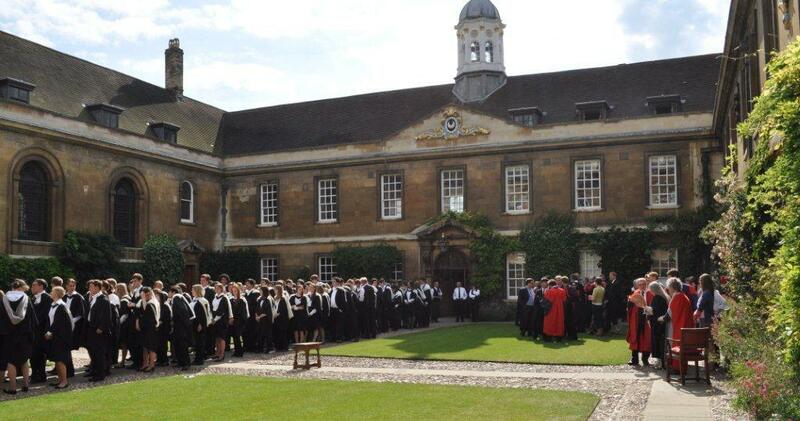 After several years teaching at a university in Ghana, he spent the rest of his days living quietly in Cambridge, although there is no record of his ever returning to darken the doors of Trinity Hall! On the day after the Royal Wedding, Trinity Hall hosted its own festivities – a celebration of benefaction. 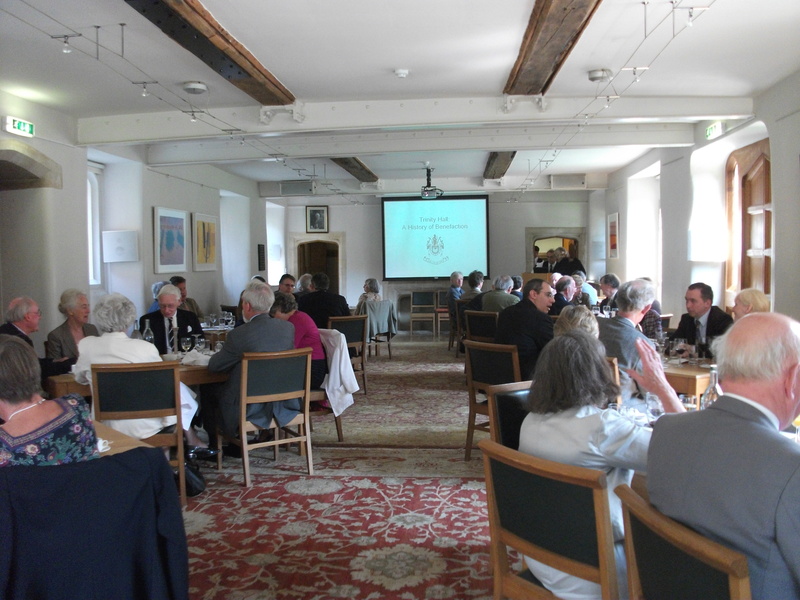 Members of the Nathanael Lloyd Society were joined by Supporters of the Old Library for a delightful afternoon. Drinks in the Master’s Lodge and a convivial lunch were followed by Dr John Pollard’s fascinating talk on the history of benefaction at Trinity Hall – starting at the very beginning with our founder, Bishop Bateman, who financed the establishment of the College in 1350 and also donated a number of his own books to the College library. During the talk, Dr Pollard showed us the Founder’s Cup (brought out of the silver vault especially for the occasion and handled carefully with white gloves). It was a real treat to see this great treasure! Nathanael Lloyd was another great benefactor of Trinity Hall and his generosity left a permanent stamp on the College. Through his sponsorship, the medieval buildings of Front Court were brought up-to-date by re-facing them with ashlar blocks. Lloyd’s benefaction is responsible for the pleasing aspect of Front Court as we know it today. 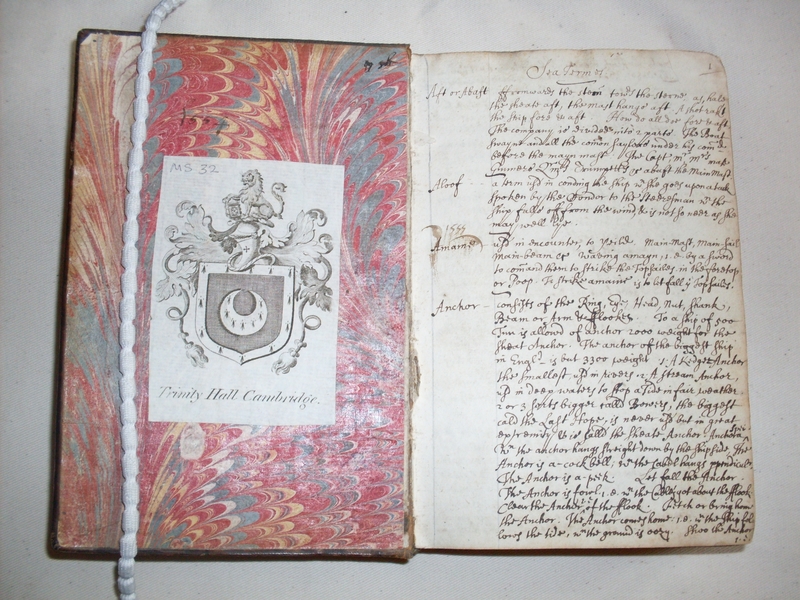 We also have a number of books in the Old Library given to us by this former Master (1710-1735) identified either by the librarian’s inscription or by Lloyd’s distinctive signature. 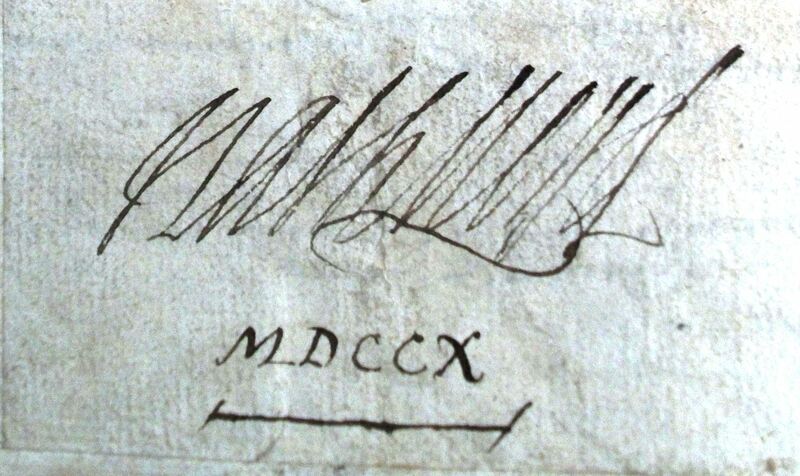 Not easy to read – but this really is Nathanael Lloyd’s signature! The afternoon continued with a visit to the Old Library, an exhibition of recent gifts and conservation work in the Chetwode Room and was rounded off by a relaxing tea on the terrace outside the Old Library. Undoubtedly, the highlight of the afternoon was the chance to talk to the rare books conservators, Melvin Jefferson and Edward Cheese of the Cambridge Colleges’ Conservation Consortium. They answered many questions and also brought along a variety of conservation materials for people to touch and see: from vellum and Japanese paper to native dyed Nigerian goatskin and examples of medieval binding structures. 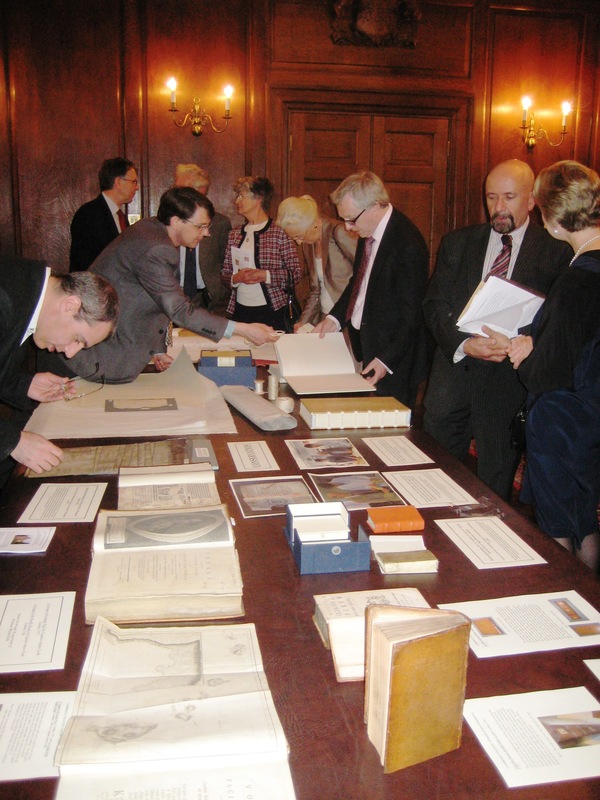 On the day we were particularly fortunate to receive donations of rare books from two Supporters of the Old Library. Alumnus Dr Philipp Mohr (TH 1990) brought us three superb (and by no means light) volumes of Papal Bulls all the way from his home in Germany. They complement the volumes on Papal Councils already in our collection and are a valuable addition to our collection of canon law (historically a speciality of the College). 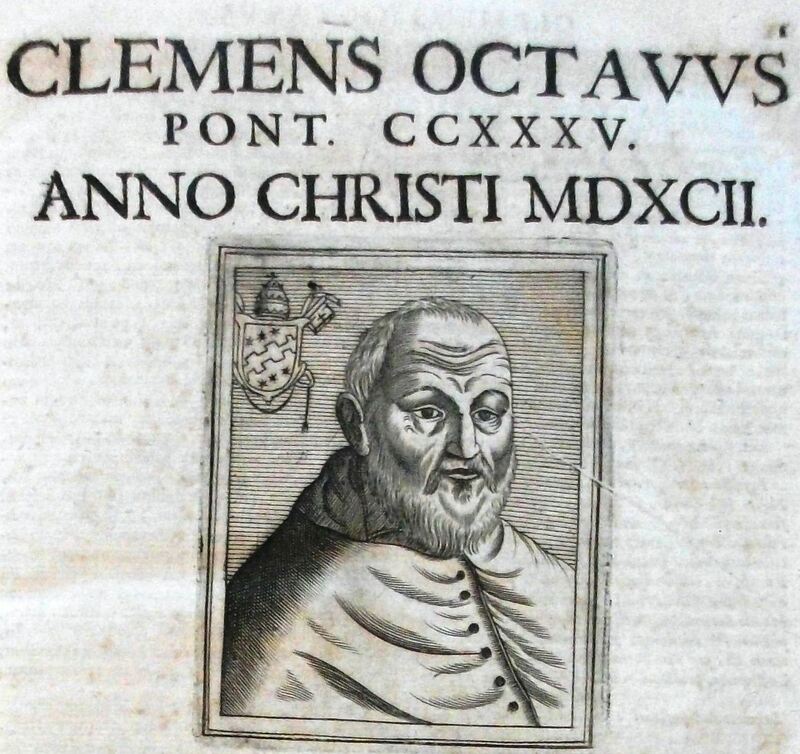 The earlier volumes of “Magnum bullarium Romanum” were published in Lyon in 1655 and are illustrated with engraved portraits of the Popes. 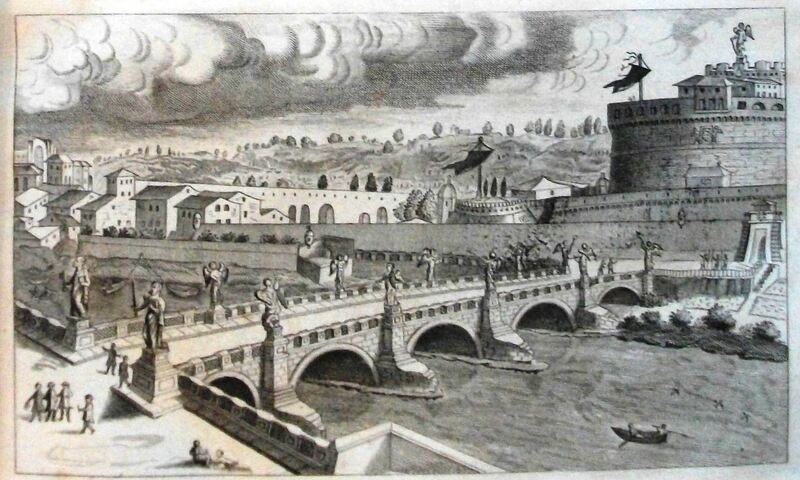 The later volumes, published in Luxembourg between 1725 and 1730, have a pleasing view of the Castel Sant’Angelo in Rome on the title page. At one point in the past this set of volumes belonged to B. Vanden Boom – whom I have been unable to identify. If anyone can help do let me know! Two years ago we were fortunate to be the recipients of a magnificent three-volume work on theology by the great lawyer Hugo Grotius, also given to us by Dr Mohr. These books joined the Old Library’s existing volumes on law by Grotius that have been in the collection for centuries. It is nice that this previous donation has been joined by a further donation of books from Dr Mohr’s library. Some book collectors start young and Dr Mohr is no exception. He purchased his first rare book at the age of twelve! The other donation on the day was of four books from alumnus, the Reverend Bill Cave (TH 1973). One of these was found at the bottom of a box in a Cumbrian junk shop and is now valued at over £2,000. Of these books, more anon! Thanks are due to Glen Sharp, Joss Poulton and Trinity Hall for the photos of Front Court, the exhibition and Nathanael Lloyd respectively. And to Wikipedia for additonal information.